Active adult communities in Northern Virginia are rich with history and beautiful scenery. While many retirees might not consider a Northern Virginia active adult community, it s the perfect region with a relatively mild four-season climate that s near family and offers an easy commute to Washington D.C. for working adults who ve become empty nesters. 55+ communities in Northern Virginia come in all shapes and sizes. There are large, gated communities that contain over 2,000 residences that include a variety of home styles. Those looking for something smaller can find age-restricted neighborhoods with less than 100 homes. There are over 20 active adult communities in Northern Virginia with developers building more for the growing number of Baby Boomers looking to downsize in a low-maintenance home. With so many options for new and resale homes, you ll be sure to find a community that meets your budget and lifestyle requirements. Active adult communities in Northern Virginia experience a four-season climate. Winters can begin as early as November and last through March. In terms of snowfall, there are typically two or three snowfalls a season. Spring is a beautiful time of year when the Cherry Blossoms bloom and the temperatures warm up from the 60s to 80s. During the summer months of June through September, Northern Virginia gets hot and humid where high temperatures can reach the 90s and low 100s. Fall is a short but picturesque season where you can watch the leaves change color. It starts in late September or early October and has an average high temperature in the 50s and 60s. Northern Virginia is broadly defined with many counties and independent cities. The counties of Arlington, Clarke, Culpeper, Fairfax, Fauquier, King George, Loudoun, Prince William, Spotsylvania, Stafford, and Warren, as well as the independent cities of Alexandria, Falls Church, Fairfax, Fredericksburg, Manassas, and Manassas Park are within Northern Virginia. Many also consider the counties of Frederick, Madison, Page, Rappahannock, and Shenandoah, as well as the independent city of Winchester within the Northern Virginia region. 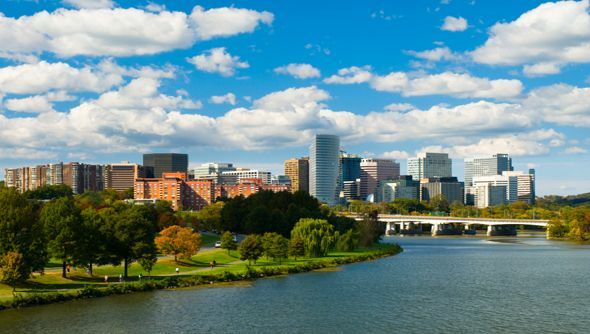 With the nation s capital situated in Northern Virginia, history buffs will enjoy living near all of Washington D.C. s attractions that include museums, memorials, and national monuments. Located about 49 miles south of Washington D.C. is the independent city of Fredericksburg. This small town is filled with charming shops, wineries, distilleries, and historic sites that include battlefields and historic homes. Outdoor adventurers will enjoy living in a region that s considered horse country" with plenty of polo matches, steeplechase races, and horse shows. Recreational attractions include Great Falls National Park, the Washington and Old Dominion Rail Trail, the Mount Vernon Trail, and water activities along the Potomac River. Sports enthusiasts will enjoy teeing up at the area s top-notch golf courses and cheering on regional minor league teams, the Northern Virginia Royals soccer team and Potomac Nationals baseball team. Northern Virginia has a higher cost of living than the rest of the state. While Social Security benefits are not taxed, personal income tax is collected in five brackets that ranges from 3.0% to 5.75%. Property tax is set and collected at the local level and varies depending on location. 55+ communities in Northern Virginia are near 21 hospitals throughout the region. Inova Fairfax Hospital is the only nationally ranked hospital and seven others have been identified as a high-performing hospital. These include Inova Alexandria Hospital, Inova Loudoun Hospital, Mary Washington Hospital, Sentara Northern Virginia Hospital, Inova Fair Oaks Hospital, Inova Mount Vernon Hospital, and Reston Hospital Center.